2018 Ford Explorer: Which Trim Level is Best for Me? You could call it the original SUV. The Ford Explorer has been around for more than 25 years and is still one of the most popular midsize SUVs in the market today. Currently in its fifth generation, the 2018 Ford Explorer has an updated and fresh look this model year. With style, performance, and versatility all key features for the Ford Explorer, you’re sure to find the right one for your needs in the five available trim levels. 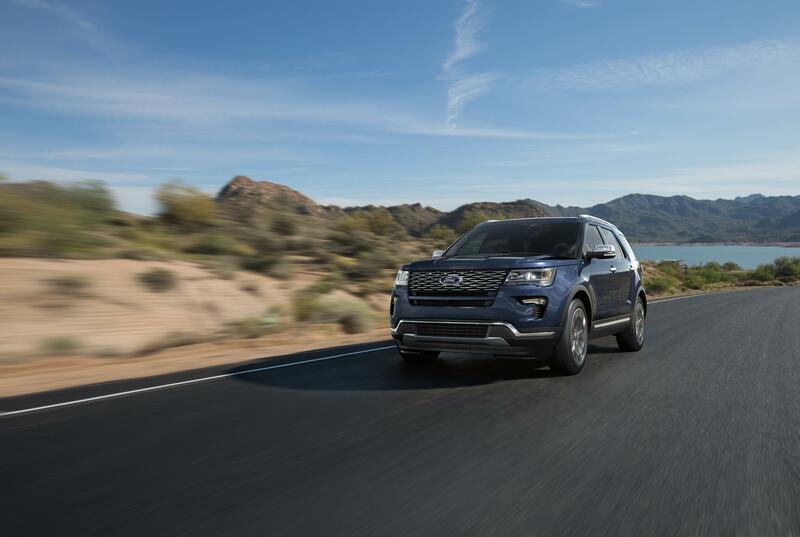 Courtesy of your Southern California Ford dealers, here are some key features of each of the 2018 Ford Explorer trim levels. This three-row SUV is chock full of value. Features include LED taillamps, 18-inch aluminum painted wheels, black exterior door handles, and automatic LED low-beam headlights. Chrome accents give the 2018 Explorer a classy look, even in the base trim. It’s powered by a 3.5-iter Ti-VCT V6 as standard, while the efficient 2.3-liter EcoBoost I-4 is available. Choose from either front-wheel-drive only or select an Explorer with Intelligent 4WD for the best in traction and handling. Interior features are anything but basic. SYNC infotainment, cruise control, power windows with one-touch driver’s window, a rear-view camera, and a media hub with USB connectivity is included. Interior upholstery is comfortable with sporty fabric. The 2018 Ford Explorer XLT adds popular features to the base trim, inside and out. They include body-color door handles, LED signature lighting, silver roof rack rails, Intelligent Access with Push-Button Start, audio controls on the steering wheel, and SiriusXM satellite radio as standard equipment. Powertrain options remain the same. In addition to standard-equipment 18-inch rims, wheels options include 20-inch aluminum rims in the XLT Sport Appearance package, along with magnetic painted grille bars, mirror caps, exterior trim, and an EXPLORER nameplate on the hood. The Limited trim adds even more class. Chrome exterior door handles, LED fog lamps, silver painted grille bars, a hands-free foot-activated liftgate, Powerfold mirrors, chrome roof rack side rails are all standard on the outside. On the inside, dual-zone climate control, a 110V power outlet, ambient lighting, heated steering wheel, SYNC 3, Forward Sensing System, SYNC Connect, voice-activated navigation, and leather-trimmed heated front and outboard rear seats are all standard also. The Explorer Limited is equipped with the 2.3-liter EcoBoost as standard equipment, or you can choose the optional 3.5-liter Ti-VCT V6. Intelligent AWD is also available along with Ford’s Terrain Management System. The fun-focused Sport trim gives a high degree of pleasure to every drive, on and off the road. High gloss black exterior trim gives it a unique appearance along with darkened headlight and taillight assemblies. Powerfold mirrors are an option along with ambient interior lighting, Blind Spot Information System, and a twin-panel moonroof. Red accent stitching gives the Sport trim a unique interior look. The 2018 Ford Explorer Sport has a sport-tuned suspension all its own. 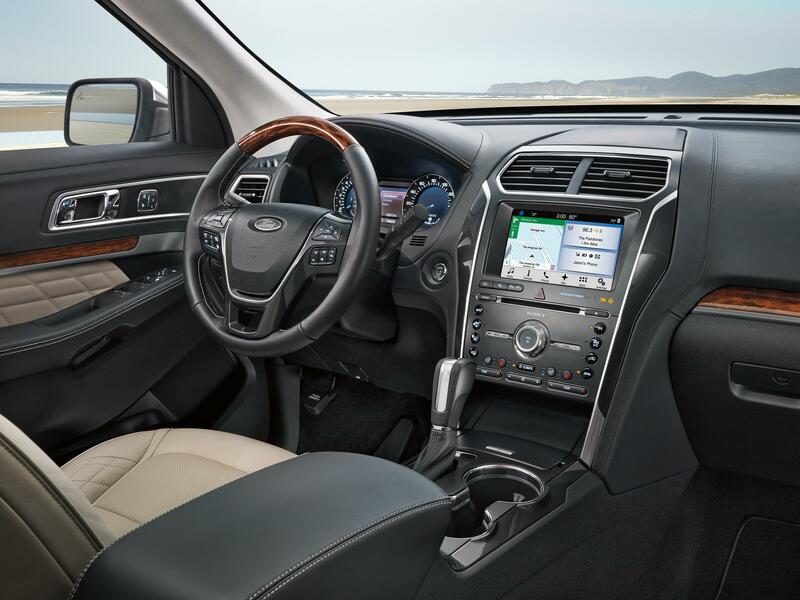 It comes standard with Intelligent 4WD and Terrain Management System and is powered by Ford’s 3.5-liter EcoBoost V6. The Explorer Sport is a rush to drive. Atop the trim levels is the 2018 Ford Explorer Platinum with a touch of luxury all around. 20-inch wheels are standard equipment along with Auto High Beams, satin chrome exterior details, and rain-sensing wipers. The same 3.5-liter EcoBoost V6 powertrain with Intelligent AWD system is standard. On the interior, expect refinement with Adaptive Cruise Control, Blind Spot Information System, Enhanced Active Park Assist, power-adjustable pedals, Premium Sony sound with SYNC 3, and fine leather with quilted Platinum inserts. There’s much more to the 2018 Ford Explorer yet. Check out the Ford Explorer and other Ford SUVs at the Southern California Ford dealer closest to you.